Hi everyone and welcome! As promised earlier this week I'm back with a much gentler, less vibrant looking canvas as part of the latest Frilly and Funkie challenge. The wonderful Nancy Dynes is our host for this one and has chosen the theme 'Pastels and Pearls'. 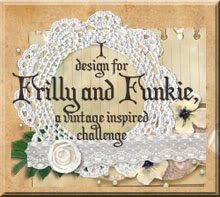 "Create any vintage or shabby chic project that features a pastel colour palette and includes pearls. Those are the only guidelines. Other than that, the sky is the limit!" 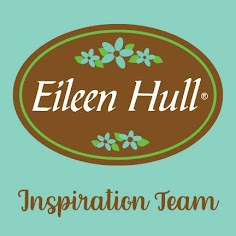 For this one I returned again to a favourite project created by Paula Cheney HERE, inspiring the soft, blended background. Harlequin stencilling with the Crazing Distress Collage Medium kicked the whole thing off before I blended my Distress Crayons over the top. I really concentrated on getting colour into the crazing to accentuate it further. Remember you can use a semi-dry wet wipe to help blend the crayons and get a lovely soft look. Typo stencilling with Texture Paste came next into the non-patterned areas and I used a little white gesso over the top to brighten the lettering. With the background complete I turned my attention to the floral centrepiece. As well as a scattering of beautiful Petaloo flowers I also added some die cut and brass leaves. Alongside a cheap pink paper flower (coloured in the centre with a drop of Rusty Lantern Lime Lindy's Stamp Gang Starburst spray) I used some Mini Tattered Florals die cuts, painted with gesso, spritzed with Shabby Shutters Distress Stain Spray, and highlighted with the Picked Raspberry Distress Crayon and a gumdrop centre. The largest textile flower and smaller pink flowers were made using some of the self-adhesive Tim Holtz Textile Surfaces. The smaller ones used the lightest colour in the pack, stuck to some Clearly for Art, coloured with the Picked Raspberry Distress Crayon and Pearl Perfect Pearls, die cut, shaped with a heat gun and finished with pearl centres. The larger flower used the darker colour in the pack, backed on to kraft card and moistened with Ink Refresher before being shaped and layered together with coloured gauze. Would a tutorial for these be helpful? I love the brass heart charm holding a piece of Wildflower paper and Remnant Rubs from the Botanical collection. It teamed up well with the white heat embossed sentiment from the Life Quotes stamp set and the final pearls. There you have it - my contribution to the collection of gorgeous 'Pastels and Pearls' creations from the Frilly and Funkie Design Team. 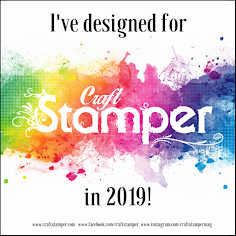 Make sure you hop on over to see their incredible makes, by which time I'm sure you'll be inspired to join in the fun and be in with a chance to win! Beautiful! It may have been inspired by me but this stands on it's own as a beautiful piece of art. The background with the crazing is stunning! Love the colors you chose! BRAVO! Wonderful piece. Yes please to the tutorial! So many beautiful layers! I adore your soft background and then the harlequin crackled effect popped out and again I was wowed. Beautiful canvas! Fabulous. The background is a pastel beauty and makes the wonderful textile flowers pop. A real beauty! Jenny Love the blend of those pastel colours , the stenciling and the crazing. Such a stunner of a background that I would have wanted to let it bask in its own glory but then I don't have your ability to create such a wonderful floral arrangement that enhances it perfectly. Just had to scroll back up and it really is a stunner-probably one of my 'buttons' faves ! Beautiful background Jenny, love the soft colours and wonderful textures. Love the floral arrangement and the burlap flower looks stunning. WOW Jenny the background is fabulous and I adore the textures and design. The floral arrangement is stunning! Oh Jenny! This is the prettiest bouquet ever! I love the beautiful blended background and the amazing texture. Your artistry never fails to delight and inspire. I find no need to repeat everything about this because you already know what is on it!!! But I can tell you how very gorgeous this is!! I am FLOORED! I am not a fan of pastels, but I am so in love with how you paired them with the crisp white stenciling and crackled harlequin! and your floral arrangement is not only creative, but divine! Yes, a tutorial would be wonderful on those blooms! Lovely, lovely inspiration! Hugs! This is beautiful! I love the overall color and your arrangement of flowers. Yes, please, on a tutorial for the flower. Beautifully done! Gorgeous soft tones, and background, and love the flowers! An elegant and fabulous piece! Very pretty colour tones, and your composition is, as always, perfection. Love the textured text around the edges too. Sorry to have missed so much again lately. You were right in your email about the juggling of time and deadlines, and it's the blogging and visiting which have slipped. I have got a couple of weeks coming up soon where I hope to do some proper catching up though!